PointsBet have a great offering for Australian spread betting fans, and they are the first full spread betting service to hit Australia. They have plenty to attract new customers, with a great welcome bonus, a fantastic mobile app, betting tips and many other things to get you interested in spread betting. The welcome offer from PointsBet is one of the best around and can give those who sign up a great boost to their new account. Users who sign up for a new account can claim a welcome bonus of . This is a matched deposit bonus of 100%, so to qualify for the full bonus bets amount your first deposit into the account must be $200. Smaller gamblers can use the same bonus, and you will receive bonus bets of 100% of whatever your first deposit it, so for example, if you deposit $100 your bonus will be $100, giving you $200 in total. There is no specific qualifying bet that you have to place, you just need to play your deposit plus bonus amount a total of once before you can withdraw from the account. Also, be aware of win limits. This is a great offer, and a huge one that big gamblers can take full advantage of, it is great compared to what some other betting agency offer and our favourite thing when we completed this PointsBet review. Check out the latest promo codes to see what sports bets and offers are currently available. PointsBet has a complete list of terms and conditions that need to be met. Read carefully in order to be eligible for this offer. Bonus funds may be used as a single bet on eligible fixed odds markets. There are many betting markets to choose from on the PointsBet website, so you should never be without something to bet on. The choice is not the biggest we have seen during out PointsBet review, but it does cover a lot of sports from global horse racing to smaller sports like baseball and snooker. Being a spread betting website the odds on offer are complex and different to a normal bookmaker. Odds comparison and racing odds can be hard to understand. However, the offerings are plentiful and you should find plenty of betting opportunities to place a bet or try multi-betting on markets you fancy on the spread. You can bet on great racing and sports events like the Railway stakes, Kingston town classic, Winterbottom stakes, rugby league, rugby union, premier league and the Melbourne Cup. 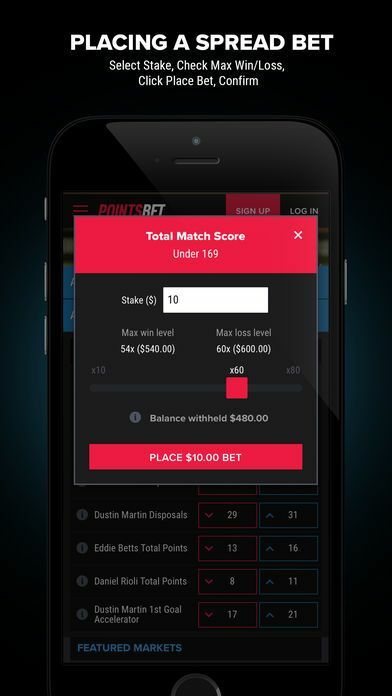 During the PointsBet review, one of the most impressive parts of their service was the mobile app that they have available. 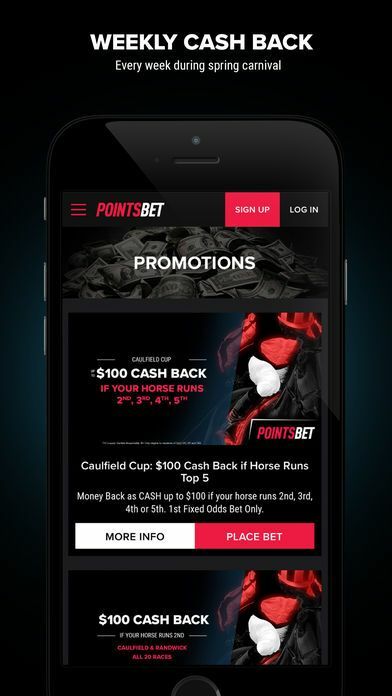 This is available to both Android and Apple users, Android users must download the PointsBet app from the PointsBet website, while Apple users can get the app from their app store. 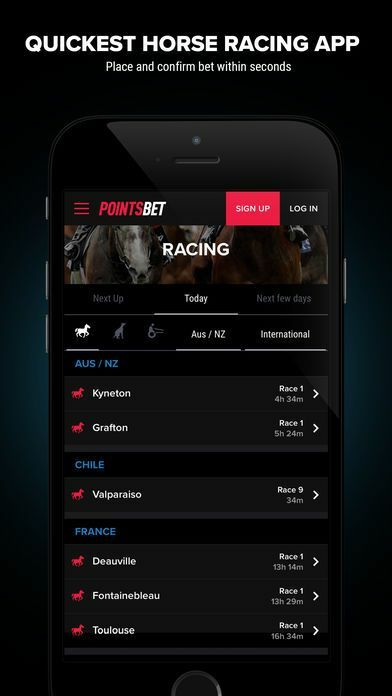 The app is certainly worth downloading after you have signed up with PointsBet and when you have it, you are never far away from placing your next bet. This is ideal for those who are busy and may not have time to place bets on the computer, you can place them on the go with the app. Alongside betting you can also deposit and withdraw funds using the app, another great thing we found out while conducting the PointsBet review. The one disappointment we had when doing this PointsBet review was that they only accept two payment methods from their customers. These methods are a credit card, debit card or a bank transfer, which are the two best and most common, but it is still a little disappointing they don’t offer more and hopefully this changes in the future. One good thing we noticed when conducting this Poinstbet review was that there are no fees associated with credit card bank transfer and no minimum deposit limits which are very good. Contacting the PointsBet customer service team is very easy to do because there are three different methods of contacting them. All three methods are open from 6am until midnight seven days a week and had this been 24-hour coverage, they would have certainly scored 5/5 in our PointsBet review. For those small queries that you need answering quickly, make sure you head to the website and speak to someone through their live chat function, this is a great tool for punters. If you have a bigger query you can either email them or call them, both are open at the same time and both suit different scenarios. With so much choice, get in touch via the best method for you, and the one most suited to your query. The spread betting site that PointsBet have put together is very impressive and players who are both new to spread betting, or seasoned professionals at it will enjoy what they offer. Their markets are extensive, and with a huge welcome bonus, you will have plenty in your betting account to explore those markets with. If you like to bet on the go then their mobile app is a great tool and one that is very easy to use. You will find yourself going through different sporting markets with ease, and placing a bet on there is simple and easy to do, as we found out during this PointsBet review. The number of payment options is a little disappointing, but their customer service offering is very good and there are many ways to get in touch with them. Spread betting is very different to normally fixed odds betting and is very complicated. Before you begin spread betting, make sure you fully understand what you are doing because you have the potential to lose a lot of money betting this way. The basics of PointsBet spread betting are this, you bet on a line and the more you are right, the more you win, the more you are wrong, the more you lose. For example, if you back on a line that there are four goals in a game, and there are none, you will lose a lot more money than if there were three goals in the game because you are very wrong with your prediction. 2. Do PointsBet have other promotions available for existing customers? We saw many different promotions available for existing customers when completing this PointsBet review, these change frequently so make sure you check the promotion section of their website. 3. Can I bet in-play at PointsBet? No, in-play betting is something that PointsBet do not currently offer.